Curtis Braaten: President, Haskap Central Sales Ltd.
As a young boy on our mixed farm, I was introduced to berry picking and gardening at an early age. Early memories such as being in the raspberry patch with mom are deep and permanent and have contributed to my lifelong passion for being outside to appreciate all that mother nature has to offer. Through these and other experiences I developed a desire to farm with my brothers and dad. During the time I spent farming with my family, my passion for fruit production started to blossom. I began experimenting with blue honeysuckle, sea buckthorn, apples, cherries and chokecherries on my farm at Birch Hills and then began several agroforestry initiatives and demonstration projects with hybrid poplar and siberian larch, some alone, some with others. Horticulture and agroforestry were replacing my more common agricultural aspirations. Out of all of this came many hours spent over the last decade volunteering at the University of Saskatchewan within their fruit development program. The knowledge and relationships gained during this time gave me the confidence to enter the fruit industry. In 2007 I, along with a few close associates started Haskap Central Sales Ltd.(licensed haskap propagation and sales) and then Northern Light Orchards Ltd. (haskap orchard) to grow and sell haskap plants and fruit. My desire to learn more led me into the Prairie Horticultural Certificate, which I graduated from in March, 2009 with a specialty in greenhouse crop production. 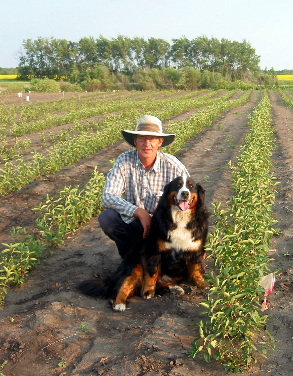 My wife Leslie and I, along with our wonderful children Kaylee and Donovan, have purchased the former Domtar (Weyerhauser) Seed Orchard and greenhouse close to Henribourg, Saskatchewan, Canada. This will be the home of Living Sky Growers Ltd. orchard and greenhouse (owned by Leslie and myself) and will also be the home location of Haskap Central Sales Ltd.
My work career has encompassed many aspects of food production, processing, preparation and service. This hands-on experience will enhance our ability to provide quality products and service to our customers. I left my position of Research Manager of the Conservation Learning Centre in June 2013 to dedicate all of my efforts to expand our own orchards and business. In 2014 Leslie and myself became sole owners of Haskap Central Sales Ltd. 2015 will see Haskap Central increase the types of ultra hardy fruits that we have to offer.